Norma Bull was born in 1906 in Melbourne and studied at the prestigious National Gallery of Victoria Art School. Her work was strongly influenced by the conservative nature of the Gallery school under Bernard Hall, and she remained a traditionalist all her life. In 1938, she was awarded the Sir John Longstaff Scholarship in Fine Art. This enabled her to move to England in 1939 to study at the Royal Academy in London. At the outbreak of war, she applied to become a war artist. 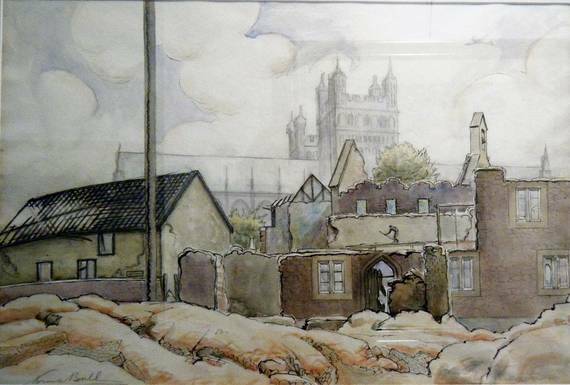 In 1941, she was given a sketching permit by the War Artists Advisory Committee to record bomb damage in the Bristol area. Her sketches represent an important historical record of life in England during the war years, but are also moving works of art in their own right. The Manchester Guardian stated that “No British artist working in the Blitz has succeeded quite so well as Norma Bull in capturing the sense of bizarre adventure and cheerful improvisation”. 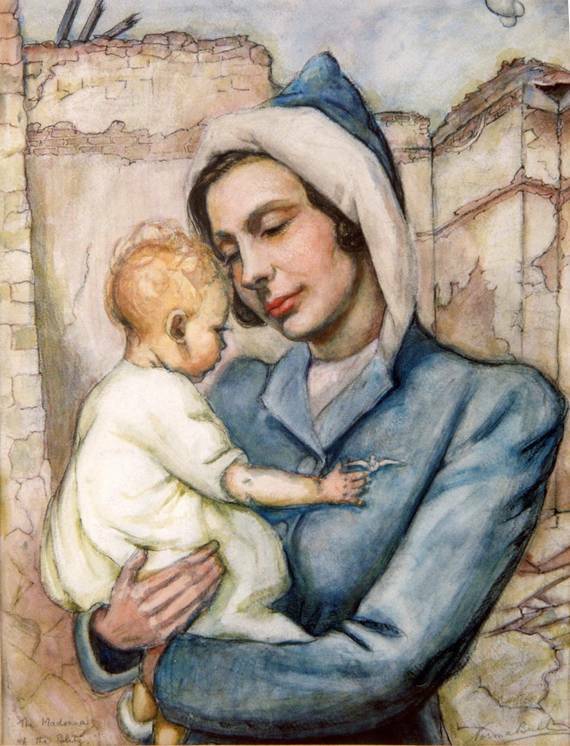 The Bright Art Gallery is fortunate to have a number of her wartime paintings including the most well known, “The Madonna of the Blitz” which was considered to have captured the stoic and serene nature of the British women during wartime. In 1947, an exhibition of her 205 wartime works entitled “Two Hemispheres”, opened at Australia House in London. Many remain in major collections in England including the Victoria and Albert Museum, the Imperial War Museum and the Royal Collection. Norma Bull returned to Australia and in 1948, the “Two Hemispheres” exhibition toured Australia. She remained in Australia and continued to paint landscapes in her traditionalist style. She had strong links to Bright, and spent 6 weeks here every year. In March 1962, she won the inaugural Bright Art and Photographic Competition with a painting entitled “Rock Cathedral, Taggerty”. Unfortunately this painting along with eighteen other prize winning paintings was destroyed by fire in 1982. When she died in 1980, the Trustees bequeathed many of her paintings to Bright Art Gallery. The Bright Art Gallery is fortunate to have 31 examples of her work including many from the wartime collection.